ML Maco is the Chief Revenue Office responsible for overall company revenue growth. ML has more than 20 years of experience driving revenue growth and building high performance sales teams for leading enterprise giants and high growth startups. ML joins CognitiveScale from HPE Pointnext, where she successfully led worldwide sales and was an integral part of the division’s go-to-market strategy and rapid growth. 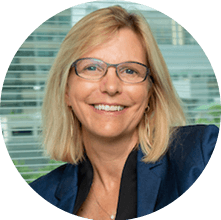 Prior to HPE Pointnext, she was Senior Vice President of Sales for Oracle’s high growth software applications business, leading the transformation to cloud. She also held several senior leadership roles at Cisco Systems responsible for driving a number of strategic businesses. ML holds a BS in Management from Penn State University and is a graduate from the Executive Leadership Program at Stanford University.